Sometimes you just need to make a lot of small changes, like adding a comma to the end of every line. In basic text editors like Notepad, you would have to manually go through each line and add the comma, twenty or thirty times if necessary. Does it sound a little tedious? Vertical selection editing is an extremely useful tool that allows you to edit, select, or add to multiple lines simultaneously. The feature is also called multi-line editing, vertical editing, rectangular selection, column mode/editing, and vertical selection. Most advanced text editors include some form of vertical selection editing, and many of these programs are available online for download or purchase. In most Windows programs and some text editors, holding down the Alt key while making your selection will activate the vertical selection tool. 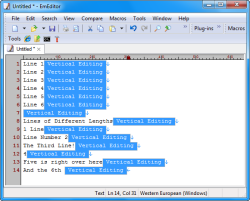 Sometimes, a text editor with vertical selection editing will allow you to edit multiple lines, but only if those lines are all the same length. Other text editors allows you to edit multiple lines regardless of length, which can be a very useful feature. With vertical selection editing, adding all of those commas, deleting offending errors, or even inserting entire phrases, is a piece of cake.